Su Dongpo was one of the great Chinese poets who lived about a thousand years ago, in the Song dynasty. Su Dongpo was an avid student of Buddhist teachings, and often discussed them with his good friend, the Zen master Foyin. The two lived across the river from one another - Su Dongpo’s residence on the north side and Foyin’s Gold Mountain Temple on the south side. Hairline rays illuminating the universe. Sitting still upon the purple golden lotus. Impressed by himself, Su Dongpo dispatched a servant to hand-carry this poem to Foyin. He felt certain that his friend would be just as impressed. When Foyin read the poem, he immediately saw that it was both a tribute to the Buddha and a declaration of spiritual refinement. The “Eight Winds” in the poem referred to praise, ridicule, honor, disgrace, gain, loss, pleasure and misery - interpersonal forces of the material world that drove and influenced the hearts of men. Su Dongpo was saying that he had attained a higher level of spirituality, where these forces no longer affected him. Smiling, the Zen master wrote: “Stinky Fart” on the manuscript and had it returned to Su Dongpo. Su Dongpo had been expecting compliments and a seal of approval, so he was shocked when he saw what the Zen master had written. He hit the roof: “How dare he insult me like this? Why that lousy old monk! He’s got a lot of explaining to do!”. 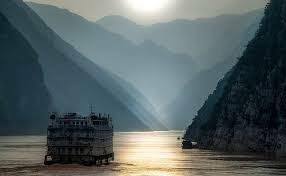 Full of indignation, Su Dongpo ordered a boat to ferry him to the other shore as quickly as possible. Once there, he jumped off and charged into the temple. He wanted to find Foyin and demand an apology. One fart blows me across the river! This stopped Su Dongpo cold. Foyin had anticipated this hotheaded visit. Su Dongpo’s anger suddenly drained away as he understood his friend’s meaning. If he really was a man of spiritual refinement, completely unaffected by the eight winds, then how could he be so easily provoked? With a few strokes of the pen and minimal effort, Foyin showed that Su Dongpo was in fact not as spiritually advanced as he claimed to be. Ashamed but wiser, Su Dongpo departed quietly. This event proved to be a turning point in Su Dongpo’s spiritual development. From that point on, he became a man of humility, and not merely someone who boasted of possessing the virtue. Extra comment: this shows that sometimes when the conditions are right, it’d only take a few words or few verse (like those cases in the suttas) to effect a significant change in the student, far more effective than reading or memorizing all the suttas.